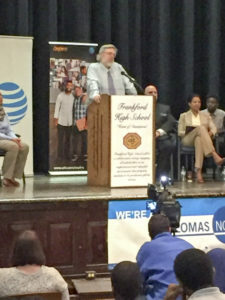 Home » Frankford High School Recipient of AT&T Aspire Connect to Success Award! 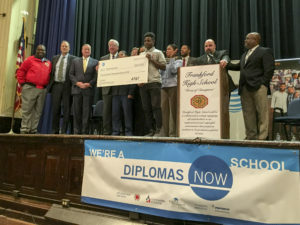 Ninth-graders at Frankford High School will get more help staying on track for graduation and preparing for their futures with assistance from Diplomas Now, a proven model that puts students on a path to graduation, which received a $500,000 contribution from AT&T. 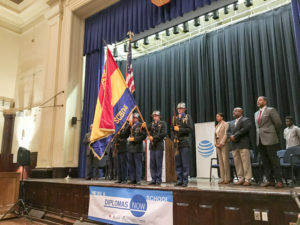 AT&T’s contribution to Diplomas Now was the focus of a special event today at Frankford High School, featuring Mayor Jim Kenney; Otis Hackney, Philadelphia’s Chief Education Officer; City Councilwoman Maria Quinones Sanchez, Philadelphia School District officials and program representatives – all of whom have a shared commitment to helping more Philadelphia students graduate from high school ready for college and careers. With the $500,000 contribution, Diplomas Now is launching at Frankford High this school year.  Operating in dozens of schools nationwide, Diplomas Now is a partnership of three respected national nonprofits: Talent Development Secondary at Johns Hopkins University, City Year and Communities In Schools, which bring caring adults to schools to provide teacher coaching, tutoring, mentoring and other student support. 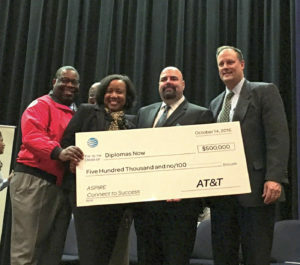 Diplomas Now was selected as one of 18 recipients nationwide that will share in $10 million from AT&T through the Aspire Connect to Success Competition. Hundreds of organizations applied to the competition, which is part of AT&T Aspire, our signature philanthropic initiative to help students succeed in school and beyond. Aspire Connect to Success funding recipients deliver integrated student supports, focus on college or career preparation, and/or provide mentoring or peer-to-peer supports to help underserved students graduate. Through a competitive request for proposal process, the 18 non-profits, including Diplomas Now, were selected based on their effectiveness in helping students graduate ready for career or college. Selected programs use evidence-based approaches to serve students and are able to demonstrate quantitative results. Diplomas Now is based on research by one of the nation’s leading dropout experts who found that a sixth-grader who fails math or English, had poor attendance or poor behavior had a 75 percent chance of dropping out of school. Diplomas Now uses an early-warning system to identify those students early and works to eliminate their problems. In June, a major independent evaluation found that Diplomas Now does reduce those early warning signs among sixth- and ninth-graders, putting more students on track to graduate. “We know that in our most challenged schools serving the most vulnerable learners, it is critical to create effective organizational structures and support instructional practices, while also providing students the supports they need in real-time – at sufficient scale and intensity. With our unique Diplomas Now partnership, building on our Talent Development Secondary model with City Year AmeriCorps Members and Communities In Schools case managers, we are able to embark on this great journey together over the next two years in partnership with the Frankford High School leadership, the school district of Philadelphia and our generous friends at AT&T,” said Dr. Robert Balfanz, senior research professor at Johns Hopkins University and principal investigator of Diplomas Now.